Kenwood have just completed works to a semi-detached home in Hemel Hempstead. We were called in following concerns of dampness affecting a wall within the kitchen. This particular project involved Kenwood working with the Trust that owns the home. The Trust is a charity who own and manage large areas of land and building within Hemel Hempstead. The area is suffering from rising damp, treatment for which started with the removal of wall plaster. The brickwork was then injected with a chemical damp proof course. The wall was then re-rendered using a render which we have specifically designed and manufactured, including additives which improve the waterproof qualities. 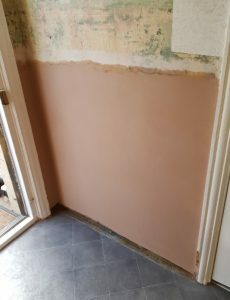 The final stage of the works is the skim coat this gives the walls a beautiful smooth finish. After a period of around a month the walls can be redecorated, good as new.